The Riverside Inn, Bovey Tracey, Devon. 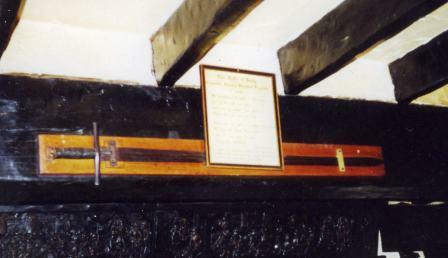 On display on an oak beam in the reception at the delightful Riverside Inn is the sword that was reputedly used to kill Thomas a Becket. The Tracey family, from whom the village takes part of its name, came to England with the Norman Conquest and acquired substantial lands in Devon. William Tracey was one of the four knights who, taking literally Henry 11’s outburst, "who will deliver me from this turbulent priest," murdered Becket in Canterbury Cathedral, in December 1170. Returning to the family estates in Devon, he is said to have thrown the sword that dealt the fatal blow into the River. It was re-discovered three hundred years ago, when the leat that now runs beneath the Riverside Inn was being dug, and it has adorned the reception ever since. In addition to the intriguing relic, the Riverside Inn also boasts several hauntings. In the late 1990’s a lady visiting from America, was woken one night by the overwhelming smell of burning. She placed damp towels beneath her door, but was still troubled by the acrid smell and went to investigate, but found no possible source for the smoke. When she complained of the experience to staff the next morning, they pointed out that it had been an exceptionally warm night and so no fires had been lit anywhere in the Riverside Inn.